Your day-by-day itinerary now includes Mornington Racecourse Market, Queen Victoria Market and Escape Discovery Adventures. Give yourself a bit of retail therapy at Melbourne Central and David Jones. 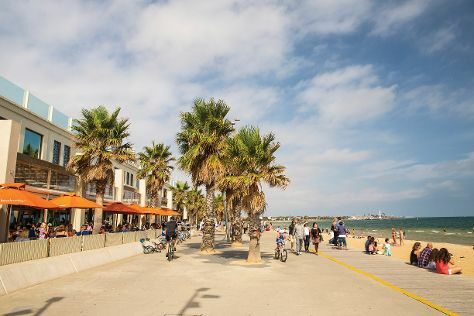 Escape the urban bustle at St. Kilda Beach and Melbourne Zoo. You'll find plenty of places to visit near Melbourne: The Great Ocean Road (in Torquay), Y Water Discovery Centre (in Yea) and Moonlit Sanctuary Wildlife Conservation Park (in Pearcedale). Spend the 8th (Sat) wandering through the wild on a nature and wildlife tour. And it doesn't end there: kick back and relax at Sandridge Beach, take in panoramic vistas at Eureka Skydeck 88, buy something for everyone on your list at Bourke Street Mall, and look for all kinds of wild species at Trin Warren Tam-boore. To see reviews, ratings, more things to do, and other tourist information, read Melbourne trip builder . If you are flying in from Singapore, the closest major airport is Melbourne International Airport. Expect a daytime high around 30°C in December, and nighttime lows around 14°C. Finish up your sightseeing early on the 12th (Wed) so you can travel to Tyabb. Tyabb is a township and semi rural coastal locality in Victoria, Australia, as a part of the urban enclave on Western Port comprising Tyabb, Hastings, Bittern, Crib Point, and Somerville. Kick off your visit on the 13th (Thu): browse for treasures at Tyabb Packing House Antiques and then identify plant and animal life at Maru Koala and Animal Park. To find photos, where to stay, reviews, and other tourist information, read Tyabb trip planner . Traveling by car from Melbourne to Tyabb takes an hour. Expect a daytime high around 28°C in December, and nighttime lows around 15°C. Wrap up your sightseeing by early afternoon on the 14th (Fri) to allow enough time to travel back home.